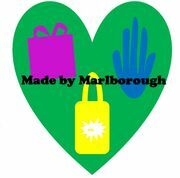 Marlborough Post 16 joined Young Enterprise in September 2018. Young Enterprise is a charity which aims to support young people succeed in the world of work by equipping them with the work skills and confidence to succeed through enterprise projects. Through Young Enterprise, the students have developed their own company: Made by Marlborough which sells tote bags, make up bags, toiletry bags, cards, wrapping paper and gifts tags with their own unique prints developed around the theme of ‘Everyday Heroes.’ Students researched, designed and printed their designs to create their products. They have also researched pricing and organised packaging. Students are supported to be involved in every step of the process as far as possible to give them an in depth experience of the world of work. They have had opportunities to sell their products at school events as well as larger community locations such as Spitalfields Market. We aim to equip our students with the resilience to flourish in their future endeavours. Volunteering and work related experiences challenge our students to navigate and cope with unfamiliar environments and people and being faced with tasks and challenges they may have not experienced before. They are also enriching and hugely enjoyable experiences for our students. Generally, students will have at least one volunteering placement they will be accessing at any one time, usually for a morning or afternoon a week. Often this takes place in small groups with the support of their class staff. As far as possible we also aim to give students individual volunteering opportunities based on their interests. Some of our volunteering and work related experiences that students have participated in have included volunteering at a local food bank, nursing home and charity football club. We also arrange for taster sessions, both onsite and offsite, for instance at the local fire station as well as a first aid taster session by St. John’s Ambulance. The independent living skills flat began development in September 2018. It was envisioned as a space in which students had the time and resources to develop their independent living skills. Equipped with typical home furniture, machines and techonology, students are able to use this space to focus on the skills that are really important to them. In the first instance, students took ownership of the flat by planning and researching what to buy for it, helping to put together the furniture and painting it the colour they had chosen! Now they have a space in which they can work on developing their independence in household tasks. Students at Post 16 have the opportunity to take part in the Duke of Edinburgh Bronze Award. This involves students taking part in activities over an extended period of time as part of their personal development and work related skills. These activities are in 4 areas: volunteering, physical, new skills and an overnight expedition. For instance, some students have been volunteering with a local community group to maintain the gardens in Danson Park. This is part of their volunteering requirement for Duke of Edinburgh and they also learned lots of new skills and made great community links. Our lunchtime clubs provide a range of extra-curricular activities based on student's interests. Students make choices about which clubs they attend. Clubs include dance club led by an external dance teacher held in the Chislehurst and Sidcup Grammar School dance studio, choir run by a music teacher from Chislehurst and Sidcup Grammar School, health and beauty, art and ICT. These clubs are supported by students from the Post 16 department of Chislehurst and Sidcup Grammar School. This student partnership has been developed to enable our students to develop relationships with a wider range of their peers through shared enjoyment of their interests. Our clubs also offer links with our Careers education, for instance, students who attend the health and beauty club have recently had the opportunity to attend a taster session at the Shooter's Hill College Hair Salon.